Tomorrow the Senate Commerce Committee will hold a hearing to better examine the state of broadband maps in the U.S. These maps currently suggest just 25 million Americans are without access to broadband internet, which is defined as speeds of 25Mbps. But according to numbers released by Microsoft today, 162.8 million people don’t use broadband internet — more than half of all Americans. That larger number isn’t surprising if you know anyone in a rural area, where internet speeds are often much slower and coverage significantly poorer. 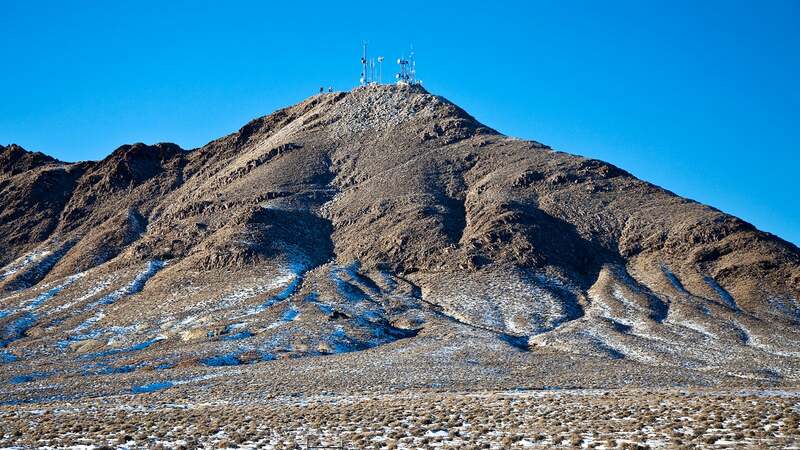 When I lived in rural Texas, I spent years trying to get reasonable internet access and found that often ISPs would refuse to build the infrastructure to reach me, or my closest neighbour...three miles away. It can be quite expensive to install the infrastructure necessary to provide speeds higher than a phone line can provide, and most ISPs are reluctant to invest in building that when there are so few potential customers. The ISPs are aided in their reluctance by some funky definitions of broadband and broadband supply that make American internet infrastructure look much more robust than it might actually be. These definitions of what constitutes broadband coverage means they can say they’re supporting huge swaths of America without actually supporting it and claim major subsidies from a government that uses the same loose definition of what constitutes broadband coverage. How much in subsidies? Microsoft claims the government has handed out over $31 billion in subsidies and broadband coverage has barely improved. As an example, Microsoft pointed to Ferry County in Washington. According to the most recent maps, 100-per cent of Ferry County residents have access to broadband. 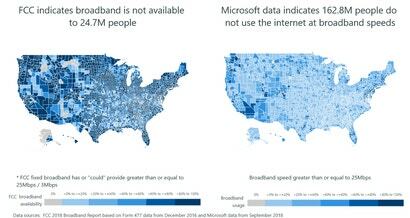 Microsoft claims that when it spoke to local government officials, they said this was simply not the case, and when Microsoft examined its data (gathered during its own rural internet initiative) it found just two per cent of Ferry County residents were using broadband, either because they didn’t actually have access, or because it was simply too costly to pay for 25Mbps. Microsoft has another problem with the maps too — it says their sampling methodology doesn’t make any sense. The maps are based on census blocks, a measurement unit used by the U.S. Census Bureau. Just one person in that block needs to have broadband for it to count as adoption. That’s probably an accurate reflection of broadband access in a census block the size of a single city block, but census blocks can get very big in rural areas. There’s one census block in Alaska that covers 8,500 square miles. Which means if one person in that block, which is nearly eight times the size of Rhode Island, has broadband, then the map will show that the whole block has broadband. At least Microsoft seems to think so (and I’m inclined to agree). Now naturally, Microsoft is concerned because it’s beneficial to the company. It’s invested billions in its Azure cloud computing platform — which can’t really be used if people don’t have internet. It’s also planning to release a new Xbox gaming platform in the coming year, and there are very credible rumours that this platform will heavily rely on streaming. 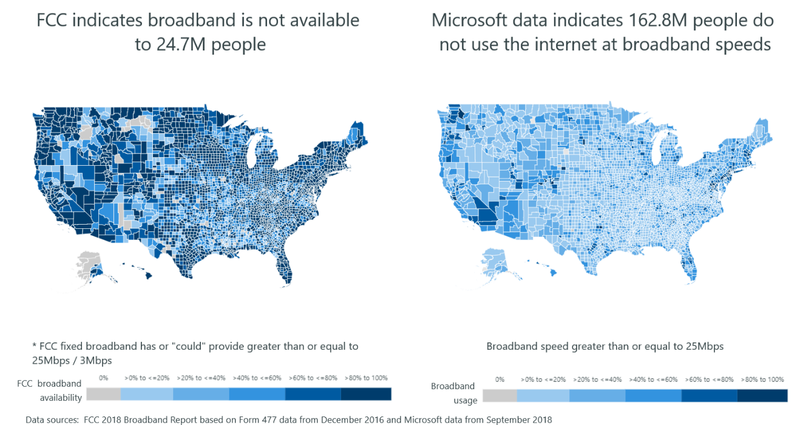 As I’ve pointed out before, streaming games doesn’t have a ghost of a chance if people don’t have broadband access—and with Microsoft claiming more than half of Americans don’t have that access that’s a whole lot of new Xboxes that could wind up sitting on the shelf.